A yoga enthusiast himself, the Prime Minister surprised everyone as he joined over 35,000 people, including leaders, officials, soldiers and students, in a yoga demonstration at the historic Rajpath Sunday morning. Leading the first International Yoga Day celebrations in the country, Prime Minister Narendra Modi on Sunday said it marks the dawn of a "new era" to bring peace and harmony in the world. "Did anyone imagine this Rajpath will become Yogpath? "We are not celebrating a day but we are training the human mind to begin a new era of peace and harmony," Modi said from the dais, adding that it was a programme for human welfare and to spread the message of goodwill. 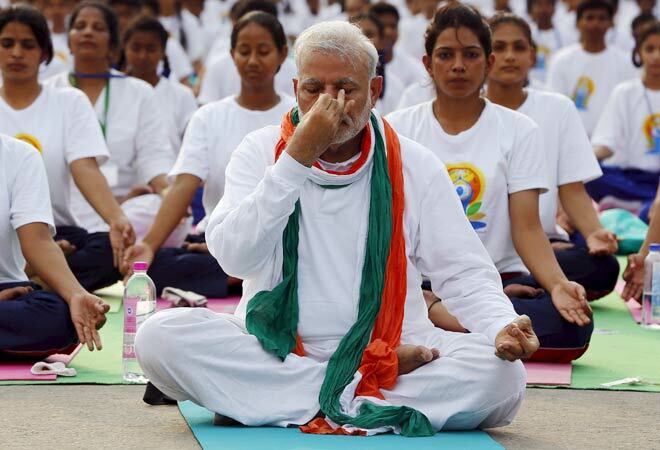 64-year-old Modi, who was expected to only address the event, later sat on the ground with other participants practising most of the 21 'asanas'. The 30-minute mega event began around 7 am at the Rajpath which was dotted with white as participants sat on their mats for the yoga demonstration. The Prime Minister, attired in white with a tricolour 'patka', along with other participants followed the instructions in English and Hindi with images on giant screens too helping them. Modi thanked the United Nations and 177 nations for co-sponsoring the Indian resolution in the United Nations for adopting June 21 as International Yoga Day. The proposal had been mooted by the Prime Minister during his first address to the UN General Assembly in September last year. "For most of the people, yoga is just a physical exercise. This is the biggest mistake.... Had this been the case, children working in circuses could have been called 'yogis'. Hence yoga is not only about making the body flexible," he said. Modi said that as mankind advances in various spheres, individual human beings must progress too and yoga was the answer. "This mismatch will also become a crisis for humankind. That is why it is necessary that internal development of man should also take place simultaneously", he added. Hailing the contributions of yoga gurus and exponents of various traditions in the world, the Prime Minister noted that at times certain deformities creep in every tradition due to ignorance. Maintaining that the asanas are just a beginning of the larger picture of yoga, he compared it with the fine tuning of various musical instruments at the beginning of a show. Modi shared the dais with Ramdev along with heads of some other religious and yoga institutions. Delhi Chief Minister Arvind Kejriwal, Lt Governor Najeeb Jung and diplomats from a number of foreign missions also joined the yoga demonstration at Rajpath. The Prime Minister who has been under attack from the opposition for "usurping" yoga event to "highlight" himself insisted that the programme is only intended to benefit people and spread the message of love and well-being. It seeks to make a tension-free world and spread the message of 'Sadbhavana' (harmony), the Prime Minister said, adding that yoga is "more than only physical fitness". There was controversy in the run up to the event with a section of minority groups opposing it. The government did not include 'Suryanamaskar' in the yoga protocol for the event after some Muslim groups claimed that it was against their religion.